Editor’s note: This is the last in a series of stories looking at how climate change is expected to affect the Great Lakes region. Climate change can feel daunting. What’s an ordinary person supposed to do about chemicals in the air making the planet radically hotter? If climate change is inevitable, though, that doesn’t mean the consequences can’t be managed. In fact, a number of state officials and academics are planning ahead to help people cope with the effects of climate change. Here are five things the state of Michigan does to make climate change easier to bear. This list is not exhaustive. Shade trees are important for people and animals. Trees with big canopies that dull sunlight and suppress temperatures underneath their leaves and branches are important to both the Department of Health and Human Services and the Department of Natural Resources’ climate change plans. In cities, where there’s lots of pavement, warmer temperatures could mean more of the urban heat island effect, making them hotter than nearby rural areas. But planting shade trees can help keep the area cooler–and that could mean people out walking in the city would be less likely to get heat stroke, said Aaron Ferguson, a program manager at the Michigan Climate Health Adaptation Program, a program through the Department of Health and Human Services. The shade trees could also help fish. Fish that do well in colder streams will have a harder time if warm weather means the water never cools. But planting trees on the banks could help because the shade could help the water stay cooler, said Christopher Hoving, an adaptation specialist at the DNR. Conservation districts in places such as the middle Grand River watershed and the Looking Glass River in Clinton County, Michigan, are already planting trees, Hoving said. A lot of streams in the region lost shade trees because of agriculture. Planting new ones returns shade to streams. “A lot of times climate change gives you reason to do something you were already going to do,” Hoving said. More trees isn’t the answer to everything, though. 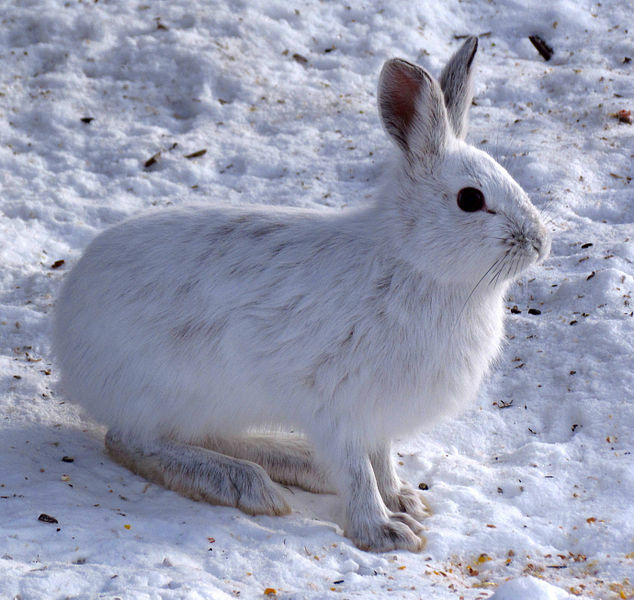 The snowshoe hare, for example, is going to have a hard time if the state doesn’t get much snow. It won’t be able to blend into its environment and will get picked off by predators, Hoving said. But cutting down older trees could help the hares. When the older forests are cut down, young, bushy trees grow in their place–and that’s a much better hiding place for the hares. The DNR is already doing it on state lands, Hoving said. The agency puts on workshops in the Upper Peninsula to communicate that idea to other land managers and private citizens. Emergency planning is a big part of climate change. It’s even something the State Police considers when planning for “hazard mitigation,” or disaster relief, according to the 2014 Michigan Hazard Mitigation Plan. The police look at climate change from the perspective of problems we already know about and sometimes experience–big storms, for example. But the plan notes a potential for even more severe storms than we’re used to having. Other people pointed it out too. Communication is one thing that becomes critical during big storms and other possible disasters like disease outbreaks. When big storms bear down on communities, vulnerable people like senior citizens will need working communication. The Michigan Climate Health Adaptation Program works with local health departments to identify where there’s already a deficit. Figuring out where we’re weak and could be weaker in the future is a big part of planning for climate change. Because of all the rain and flooding during big storms, sewers and sanitation systems are a big concern, Ferguson said. Some of them already struggle during heavy rain, dumping dirty water into public beaches or flooding people’s’ basements with sewage. Those systems will need to be fixed. And even systems that are doing okay now might need more capacity in the future because of flooding caused by climate change. Bridges might also need improvements, Hoving said. There are plenty of roads, dams and culverts on land owned by the DNR. But those pieces of infrastructure were built using precipitation data from the past 30 years. “Extreme precipitation events” of more than three inches of rain over a couple of days are going to become more common, according to all the scientific modeling, Hoving said. It’s basic physics–warmer air holds more water, he said. If new bridges are built based on old data, we’ll be “under-engineering” them. Roads could wash away and the bridge won’t cross water — the water will cross it. There’s a lot we don’t know about what climate change will do to the Great Lakes region. For a long time, scientists thought Great Lakes water levels would go down as the global temperature goes up. But a few years ago, research by Brent Lofgren, a scientist with the National Oceanic and Atmospheric Administration’s Great Lakes Environmental Research Laboratory showed flaws in the models that were used to predict water levels. Ever since then, climate scientists have been rethinking that idea. “I think the main consensus now is that the expectation of lower levels is flawed thinking,” said Michael Notaro, a senior scientist and associate director of the Center for Climatic Research at the University of Wisconsin-Madison. Now, scientists are collecting more data in new ways to try to understand the lakes. Among the research that is or will soon be conducted are a NASA-funded project that will use 3D technology to understand lake currents and a project that will collect more data on evaporation, Notaro said.